We here at Kessil are extremely excited to announce that our most compact and efficient light ever is shipping now! The A80 is small but mighty, packing all the features of our larger pendants into a pint-sized package. This fixture is designed for any tank owner looking for a sleek, cutting-edge aquarium light. Built around the Dense Matrix array and our unrivaled optics, the A80 features smooth color mixing, powerful penetration and a natural shimmer. The A80's shell-shaped design dissipates heat so effectively that no fan is needed, ensuring totally silent operation. Quickly set the intensity and spectrum using the dials on the fixture or create automated schedules with the optional A-Series Spectral Controller. Daisy-chain multiple lights together for seamless control. 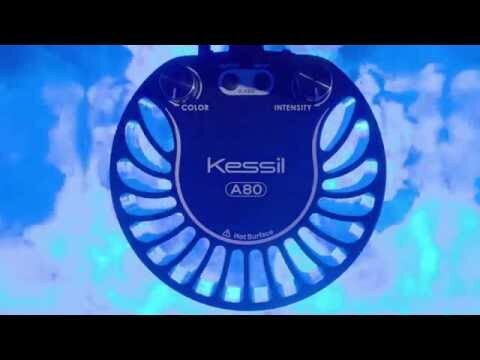 Kessil Logic comes with every A80 and leverages our knowledge of the wavelengths corals need to thrive, allowing users to pick any spectrum they choose while ensuring great coral coloration and growth. Each A80 can cover up to a maximum of 24"x24" when mounted 6" above the tank. Arrived in 2 days. Lights are solid, and built to last. I'm using (2) of them on a 29g biocube. I decided to use 2 in order to have them both on at about 50%, rather then having one on full blast. Color blending is as expected from Kessil. My soft corals and leathers reacted very positive to the light and started showing a nice response after the lights were on for an hour. Could these grow sps? One could on 80-100% if left on for 10-12 hours @ 4" away from water surface and sps moved to the top of the tank. Normally if you're worried about not having enough light intensity, just leave the lights on longer to make up for it. My red bubble tip Anemonie was happy under it. I will be growing LPS and softies under this and maybe a mint acropora.